improve auditory processing Archives - Pride Learning Co.
Start out by pronouncing each family member’s name by clapping it syllable by syllable. Then ask your child to say and clap the name along with you. Each clap represents a syllable or word part. After each name has been clapped ask, “how many syllables did you hear?” You can also have your child place two fingers under her chin, so that she can feel her chin drop for each syllable. This also allows your child to feel the vibration of each syllable. Using the same pictures, place them in a bag. Pick out a picture from the bag and don’t show it to your child. Pronounce the name of the picture, phoneme by phoneme. For a picture of a cat, you will say /c/ /a/ /t/. Then your son guesses what the picture is from your isolated sounds. Take turns guessing each other’s pictures. Have your child sit on the floor, close his eyes and identify sounds that you make. You can drop a pencil, bounce a ball, tap on the window, use a stapler, cut with scissors, sip on a cup of coffee or type on your computer. Trade roles and then let the child make different sounds that you have to identify. Sit outside under a tree with your child. Listen for various sounds like birds chirping, airplanes flying overhead, cars driving by, voices of children playing are pretty fun to identify. You can have a little notebook on hand and keep a list of all of the different sounds you come across. Sit across from your child and clap your hands to a rhythmic pattern alternating between slow and fast tempos. Have your child repeat the pattern. You can also use various instruments, play a drum or bounce a ball to a variety of rhythms. Switch roles and let your child be the sound leader as well. Hide a metronome or a ticking clock somewhere in your home. Have your child find it by locating the sound. Another variation of this game can be played outside. You can hide somewhere and blow a whistle. The child will then follow the sounds to find where you are hiding. Read a very simple story to your child with soft music playing in the background. Before reading the story, tell your child to listen for specific pieces of information in the story (for example the main characters name). 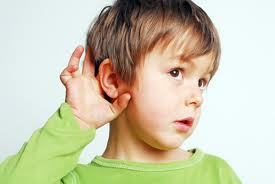 You can gradually increase the difficulty of the information you want your child to listen for. Read an unfamiliar story to your child. Afterwards ask your child questions about the sequence of events. What happened first, who went to the game, etc. Continue to ask questions until the events in the story have been reviewed. You can also ask your child to predict likely events in the story.